We’re excited to announce that we’ve partnered with Oxipay! If you’re a Kitomba customer in New Zealand or Australia, you have the option to offer Oxipay. Now your clients can enjoy visiting your salon, spa or clinic today, and pay for the services or products over time. Oxipay is an instalment payment solution which gives your clients the choice to enjoy their service or products now and pay for them over time. Oxipay is powered by FlexiGroup, the company who bought you Q Card, Q MasterCard and Farmers Finance Card. The ability to pay for your service or purchase over time is no longer just a trend, it’s becoming a standard payment option that many consumers expect when they shop at any retailer or service provider. Instalment payment solutions, like Oxipay, allow your clients to have their service or products straight away, enjoy the moment and take control of the cost, by spreading it over manageable payments. Oxipay has found that offering consumers this kind of flexibility often helps to drive repeat business and increase consumer spend, which is great news for your salon, spa or clinic. What do you need to know about Oxipay? What payments will your clients make? Oxipay lets your clients spread the cost of their purchases over four interest-free fortnightly payments with the first instalment paid at the time of purchase. Are there set-up fees, interest or other charges for your clients? Oxipay is interest free and there are no fees to use the service. However, if your client doesn’t make their payment on time, a late payment fee of $10 will apply. What does it cost a Kitomba salon, spa or clinic to use Oxipay? We’ve worked with Oxipay to ensure that we can provide the best available rate! Please contact Oxipay for more details. When do you get paid for the service? Even though your clients are paying for their purchase in instalments, you’ll receive payment for their purchase, minus the fee from Oxipay, the next business day. Visit the Oxipay NZ or Oxipay Australia website to become a merchant. Next you’ll need to create an ‘Oxipay’ payment type in Kitomba. Visit our support guide to learn how to set up a payment type. This way you’re ready to create an Oxipay order whenever a client wishes to make their purchase using Oxipay! If your client wishes to make their purchase using Oxipay, it will just take a couple of minutes to get them set up. Get your client to sign up to Oxipay using their smartphone. They’ll need to fill in some details and Oxipay will immediately let them know if they’ve been approved or not. All approved Oxipay customers receive a credit limit of $1,000. 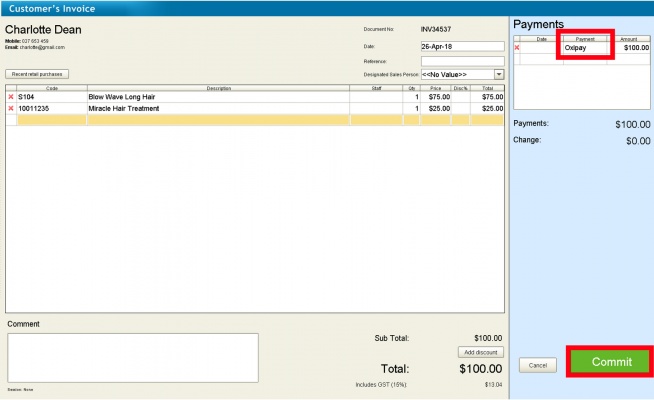 Add any services and retail products to your client’s invoice as usual. Let them know the total to pay. Order number: We recommend including the clients name and Kitomba invoice number. Order price: As per their Kitomba invoice, including GST. Order description: Detail the services and products the client has purchased. Your client will need to select ‘Shop instore’ on their smartphone. A six digit code will display on their screen and be sent via text message. You’ll need to enter the code into the Oxipay website. Once you receive confirmation that Oxipay has accepted payment, open Kitomba. There change the payment type to ‘Oxipay’ and commit the invoice. For more help getting started with Kitomba and Oxipay, visit our support guide. Providing unbeatable support is important to Kitomba, so when we were looking for a part payment partner Oxipay stood out because they focus on fantastic phone support too! When you sign up to Oxipay, you’ll receive a welcome pack. This includes all the information you’ll need to get started with Oxipay. You’ll also receive a variety of point-of-sale materials that you can display in your salon, spa or clinic. For example, stickers to put on your mirrors or front windows and wobblers for your EFTPOS machine. These materials will let your clients know about Oxipay and promote this new payment option. For more information about Oxipay, visit their New Zealand or Australian website. Can you tell me what the fee from Oxipay,how much is that? And is the contract ? Hi Victoria, Oxipay doesn’t have contracts, so you can use their service for as long as you wish! In terms of the fee Oxipay charged, we’ve worked with Oxipay to ensure that we can provide the best available rate! We’ll be in touch with you via email with more details. Thanks! Hi Alyson, we’ve just emailed you. Thanks! Can I have that email too please? If it’s the ‘best available rate’, why not mention it in the article? Hi everyone, if you’re a Kitomba customer you will have received an email on April 30th outlining the Oxipay fee details. Please refer to your emails or contact Oxipay for more information! Thanks. I did recieve the email but it was just a link to this blog. Can I please have some more information as to the fees and charges associated with me being the merchant. To take payment on line . I clicked on the link so someone would contact me about 3 weeks ago, then called. they told me they can’t help me and someone from the sales team will follow up the lead…..still nothing. we are interested in using Oxipay, what is the difference between your services and after pay/salon pay? Can you please resend me the oxipay fee details. Hi Megan, we’ve passed your details onto Oxipay and they will be in touch soon.